Hey there, thanks for stopping by! Today I’m looking at the Vortex Solo 10x36mm Monocular. This is a compact, lightweight monocular designed to be carried as a standard piece of equipment. Vortex is known for their quality optics, so I was anxious to see how well this particular piece of glass would stack up to the name. Let’s take a look, shall we? The included accessories are a hit and miss bag of goodies. The neck lanyard is comfortable to wear and good quality, and the utility clip is extremely heavy-duty and unlikely to fail at any point. Unfortunately, the included carrying case does not fully cover the monocular – the sides are open, exposing the device to the elements. I also wish the monoc came with at least an objective lens cover, but it does not and the aftermarket lens caps are ill-fitting. How Powerful is the Vortex Solo Monocular? This particular model provides 10X magnification from a 36mm objective lens. For the money, the clarity and resolution are best in class. You don’t get the super resolution of a Zeiss or Leica, but you aren’t paying for those when you get this monocular and can’t really expect the optic to compare with them. What you do get is resolution and clarity that exceed every other monocular at this price range. How Good Are the Optics on the Monocular? This model features fully multi-coated optics, providing you with fantastic light transmission by way of multiple anti-reflective coatings applied to each air-to-glass surface. 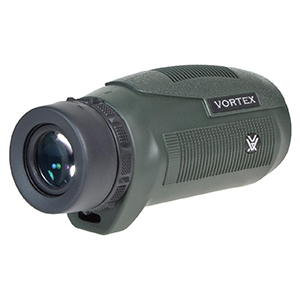 Using a roof prism design, Vortex has been able to design a highly durable monocular that can easily fit in your hand. This particular monocular has the lenses sealed with O-rings to keep out dust, dirt, debris, and water, and the barrel is nitrogen-purged to prevent fogging. This glass has been with me in all sorts of weather conditions, and it’s never failed to provide fantastic viewing when I needed or wanted it the most. The field of view through the Vortex Solo is 325 feet at 1,000 yards, which is a generous amount of territory to cover. You can quite easily find your target, whether it’s a bird for observation or a deer for hunting, using this monocular. The weak point of this particular model, though, lies in close focus. You need to be at least 16.4 feet away from your subject to get a crisp focus, which makes the glass ill-equipped to provide you with a close-up view of objects nearby. The monocular has an adjustable eyecup that twists up and down for a custom fit for eyeglass wearers, but the eye relief is really too short to be comfortably used by such owners. With just 15mm of eye relief, I found that I had to press the monocular against my eyeglasses uncomfortably hard to get the largest field of view. I wish the eye relief was designed to be more like 19mm instead of 15mm. What Can I Expect From the Body of This Monocular? The body of the Vortex Solo 10x36mm Monocular is very ruggedized, and is ready to tackle almost anything you might throw at it. Other reviewers have commented negatively about the weight of the monoc, since it comes in at 9.7 ounces, or almost a full pount with the utility clip attached. Here’s my take on that: I’ve used the monoc with the utility clip attached and detached, and I’ve found that the glass is much easier to hold steady when the clip is attached to the monocular. That extra heft lets gravity do its thing and keep you from raising it too high. Like other Vortex Solo monoculars, this model is built to last with rubber armor to give you a good non-slip grip. Not only that, but the well-built rubber armor gives terrific external protection to the glass. Vortex stands behind their products in a way that few other optics manufacturers do. Their VIP Unconditional Lifetime Warranty is fully transferrable, and Vortex will provide you with free repairs or replacement of your optics, no matter how the damage happened, whose fault it was, or where you purchased it. There’s no warranty card to fill out and no receipt needed. Just call them up, send in your damaged monocular, and they take care of the rest. They can do that because they build a very durable product. The rubber armor coating the monocular provides excellent shock resistance, and mine has fallen from my 20-foot tree stand on more than one occasion without damage. A couple of people have complained about sand getting into the case of the monocular, because it’s open to the elements, and I just have to laugh because the monoc won’t be harmed by that sand. It ain’t getting in! How Well Does the Vortex Solo 10x36mm Monocular Work in the Field? This monocular works beautifully in the field, whether you’re hunting or just shooting at the range. I’ve used mine as a handheld spotting scope when I didn’t have mine handy (never loan out your spotting scope; you never know when you’ll get it back.) I’ve also used it in the woodlands to spot bucks that I wouldn’t have seen otherwise. This monocular is definitely a standard piece of kit for me. Unless I’m testing another monocular, this is the one I’m carrying most of the time. It’s lightweight enough not to burden me too much, but heavy enough to provide some added steadiness to my hold. Thanks for coming along with me to check out this monocular. Overall, it’s an excellent buy for the money. You don’t get the resolution of a $300 monocular, but it’s darned close and at a third of the cost. There are some drawbacks to the Vortex Solo 10x36mm Monocular, but the positives are so good they far outweigh the negatives.